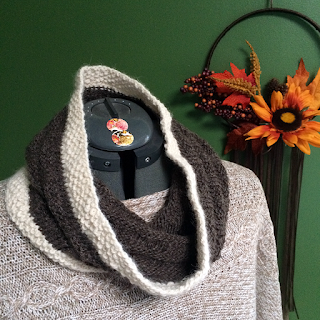 In mid November, after the election, I felt inspired to create my first original knitting pattern. I thought it would be appropriate to release the pattern for my first "podversary" on January 11, 2017. To that end, I started translating the pattern I had in my head on to my needles. Inspired by the photos of aspen trees in the winter by Ansel Adams popular in the 80s, I created a cowl with a seed stitch border (the "snow") and a center section in the Trinity stitch (the "birch"). I knit the first, or "country" version of the Aspen Winter cowl using Romney Lamb worsted wool from Prado De Lana farm for the center, the birch section, and some handspun natural alpaca for the snow section. The small bobbles created by the Trinity stitch really mimic the knots in the birch tree in this yarn, and the contrasting cream alpaca frames the natural wool perfectly. 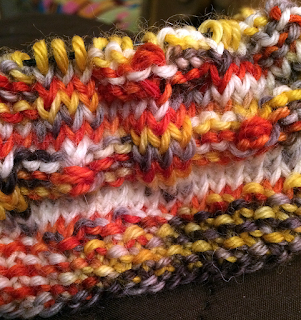 My friend Robin of Robin's Roost yarn agreed to create a custom colorway for my "town" version of the pattern. 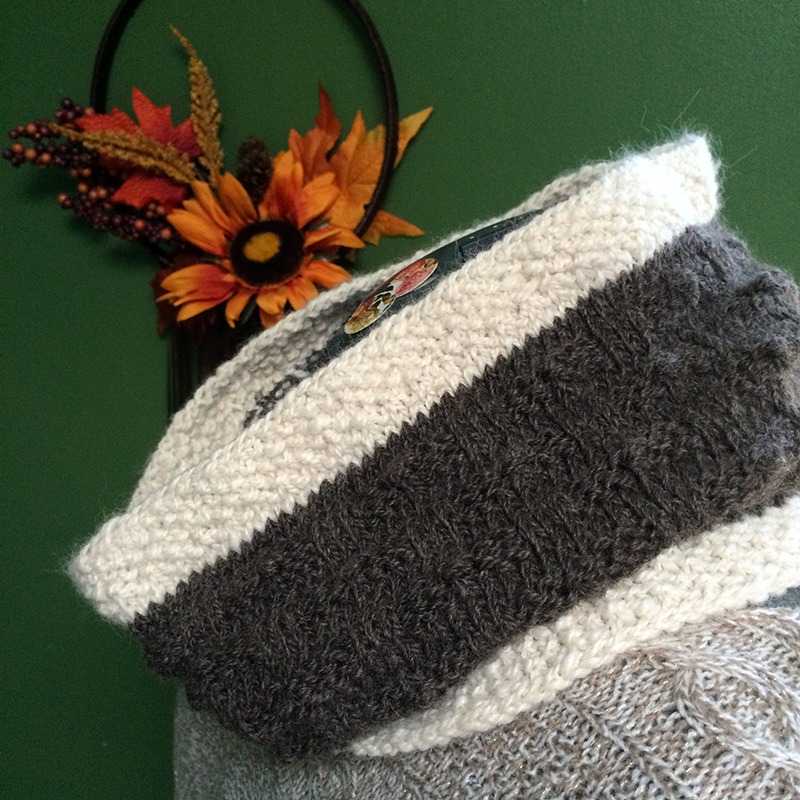 This 100% wool not only has the cream, gray, and black of the birch trees but the bright yellows and oranges of the fall leaves lying on the forest floor. I'm halfway through the test knit for this version and anticipate finishing it by the end of the week. I've opened a thread in the ravelry group for anyone interested in test knitting this pattern (you must join the group to participate). 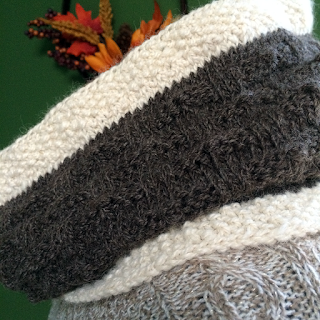 I ask that you indicate what yarns you intend to use in that thread, complete the test knit done by December 30, 2016, and create a project page for your test knit on ravelry. I know it's the holidays with lots of gift knitting but then again, no reason you can't add this pattern to your gift knits!! In book news, I love to read Little Women by Louisa May Alcott during the Christmas season. I mentioned the book to some of my seniors, and one of them knew the opening line by heart! Christmas won't be Christmas without any presents, grumbled Jo, lying on the rug. While I don't read this book every Christmas, I do every few years. This past Saturday, I found a copy from 1976 at my local library's book sale for 25 cents - best deal of the season! I started reading that afternoon, and on Sunday, when I woke up a bit sniffly, I made a pot of tea (complete with my grandmother's knitted tea cozy) and settled in with Meg, Jo, Beth, and Amy. Anyone else love reading Little Women this time of year? Definitely a great way to get into the spirit of the season! Today I'm joining The Really Crafty Link Party. On Tuesday's, I join Nicole at the Keep Calm Craft On link party. On Wednesdays, I participate in the Yarn Along on Ginny Sheller's blog. Please join us either by contributing a link to your fibery work in progress and current read and / or by checking out the posts to the link parties. You may find your next book or project waiting for you! Oh my, I think I need to read Little Women soon. It has been far too long. I admit, I read the original version of "Little Women" which is now considered part 1. I find that "Good Wives" is too depressing and the girls don't end up marrying who I wish they did. The original version is one year in the life of the girls before they marry and bad things happen. 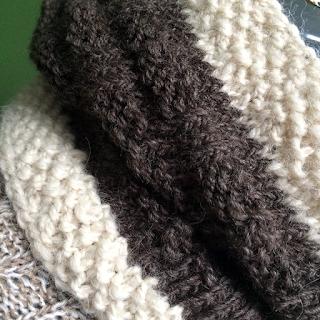 It's a beautiful cowl. Oh, and I loved Little Women when I read it, but I confess it must have been almost thirty years ago. You've made me want to go back and read it again! Thank you for sharing at The Really Crafty Link Party. Pinned! It's supposed to be snowy and cold here tomorrow. 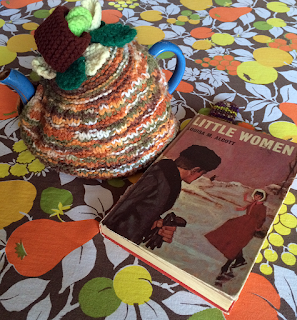 Your post makes me want to stay in, make a big pot of tea and read Little Women. It's been YEARS since I read it but I loved it when I did read it.